Dogs can bring immense joy and prosperity into your life. Numerous studies have proven that the companionship of a dog can increase health and life expectancy for owners and provide lasting happiness and security to families and individuals. Hi, I'm Myra. I have been breeding and exhibiting small breeds since 1974. Over the years, I have had the pleasure of providing numerous people and families with healthy and happy puppies to complement their lives. 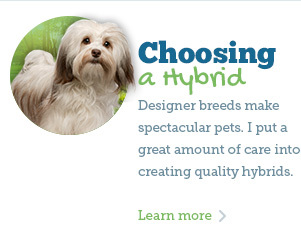 All of my puppies are temperament tested and are bred to conform closely to the breed standard. My litters are registered with America's Pet Registry or the American Kennel Club. I specialize in breeds that are non-shedding, odorless and hypoallergenic, which gives the opportunity to many allergy sufferers to enjoy the benefits of a loving companion. My aim is to breed each of my puppies with calm temperaments that are lovable and cheerful, not nervous or aggressive. My Bichon Frise, hybrid breed and other smalltoy breed puppies are raised in my loving home and socialized with kids and other dogs from an early age. They are kept up to date on shots, worming and have preliminary paper training when they go to their new home. When it is time to choose a Bichon or other small toy breed, it is important that you look not only for distinguishing traits of the dog's breed but also that you work with a trusted breeder. 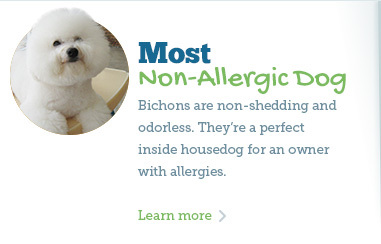 I carefully interview all prospective clients and try to ascertain if, indeed, a Bichon Frise is the right choice for them. As a Bichon breeder, my even more important task is to match the right puppy to the right home. For many years I have been a respected member of high-profile local business organizations as and I am active in The American Dog Owners Association, The National Associate Breeder Program, and America's Pet Registry. 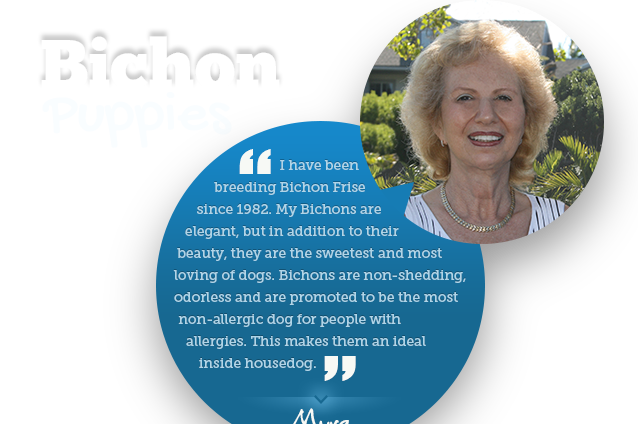 With Myra's experience and insight, you can rest assured that you will be adding a happy and healthy dog to your home. Each puppy is raised in my home, never kept outside, and is fully, socialized, vaccinated and checked by a veterinarian prior to purchase. 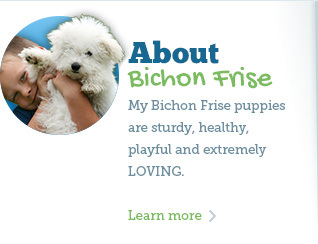 Toy Puppies by Myra is a Fort Lauderdale Bichon Frise puppy breeder. I am an experienced registered shipper and I ship puppies throughout the United States, Puerto Rico, the U.S. Virgin Islands, and South America using trusted and reliable airline shipping that is safe and allows them to arrive quickly and comfortably at their new homes. I am very interested in working with my customers and helping them select a puppy that will be right for their lifestyle. When you work with me, I will ask you many questions about your daily lifestyle, home and family. I try to discover what you expect from your new dog and what would make you very happy. Most of the time, I will match a dog to my client's lifestyle that is perfect for them and their schedule, and will fit with thier size of home, and other concerns, and everyone is happy with the choice. I have more than 30 years of experience working with dogs and raising beautiful and well-behaved puppies for my clients. If you have questions about a particular breed or you are interested in purchasing a puppy, do not hesitate to contact Toy Puppies by Myra today. I would be happy to answer any questions you may have about the breed and I can address your inquiries regarding available puppies.